The 2018 CME Group Tour Championship golf tournament for women players on the LPGA Tour is taking place this week from November 15-18, 2018, on the Gold Course at the Tiburon Golf Club located on Naples, Florida. Here is a list of the prize money up for grabs for the LPGA women golfers this week at the 2018 CME Group Tour Championship. 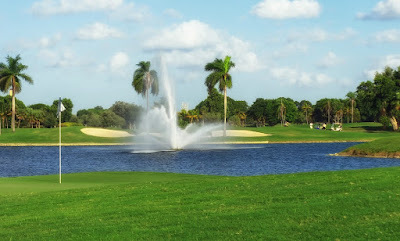 The CME Group Tour Championship is the season ending tournament on the LPGA Tour. At the conclusion of this event the Race to the CME Globe winner will be determined and the bonus prize money will be paid out like for the FedEx Cup on the PGA Tour. You can see the Race to the CME Globe payouts here. The CME Group Tour Championship dates back to 2011. The inaugural winner of this event was Hee Young Park followed by Na Yeon Choi (2012), Shanshan Feng (2013), Lydia Ko (2014), Cristie Kerr (2015), Charley Hull (2016) and Ariya Jutanugarn (2017). Total prize money up for grabs at the 2017 CME Group Tour Championship is $2.5 million. That's the same amount of prize money that was up for grabs here last year. The field this week is limited to the top 70 players in the Race to the CME Globe ranking system. All players who complete the tournament will get a payout with the 70th player getting at least $4,000. Most LPGA tournaments pay out 15% of the total prize money to the winner but this week the winner of the 2018 CME Group Tour Championship will earn 25% of the total prize money. So the winner this week will earn the second highest win payout for any LPGA event this season. Only the 2018 U.S. Women's Open ($900,000) had a bigger payout for the win.